For long as I remember, I have been in love with donning a saree. I still vividly remember being a four year old, draped in mom's saree and flaunting it around. As I grew older, my love for saree grew stronger. I would look forward for every small occasion to wear it. I had matching blouses stitched for mom's kanjeevarams, and heavy border sarees. I got a hang of draping the saree from quite early one. I can drape a saree in less than 10 minutes, and chiffons and silk sarees are the easier ones to drape than the heavy kanjeevarams or brocade sarees. Anyhow, my taste in sarees has moved past the heavy Kanjeevarams to more subtle and soft and elegant chiffon's. 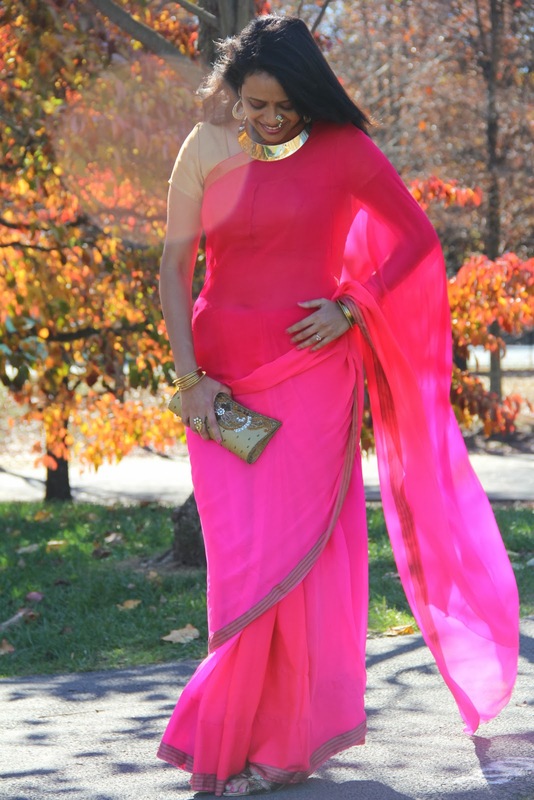 The pretty pink saree I am wearing in the post today is one of my recent loves. I actually got it cut and done up at a cloth store in Vile Parle (a suburb in Mumbai). When I first laid my eyes on it, I must admit, I wasn't it's biggest fan but my mum-in-law egged me on to try it. The sales guy helped me drape it and voila..gorgeous did it look! The neonish hue looked in-vogue and the material felt light-n-easy on me. Finding and stitching the right fit blouse is always a challenge when you visit India for less time. Well, good for me ready-made blouses were so in-trend in India and I gave in. The fit is great for a ready-made blouse and there are so many options available that stitching a blouse looks like a passe. I wore this saree for Laxmi-Pooja last year with the perfect traditional accessory there can be - a Maharashtrian Nath! Visit Ashy's blog: The Zing Of My Life, to get your regular dose of her Zingy Life and lots of fashion inspiration. Her FB page is equally inspiring. Thank You for Reading and Keep visiting So-Saree, because we are blogging every day for a month. Gorgeous look ashy.. I am totally enjoying this series aditi..
Oh my god ! Ashwini, you are a vision ! Gorgeous, love the beautiful color!!! Best Collection of Designer Sarees. I was looking for such clothes for a long time. Finally got it here. Thank you so much. keep up the good work.